The new issue just arrived in my mailbox-- that cake on the cover looks amazing! I need to have a party pronto! Anyone else get the new issue yet? Got the issue on Halloween but I haven't had much time to look through it yet. I agree that cake looks wonderful. I like how by not having the icing covering all the layers it adds that much more interest. I loved the cheddar with the carrots. My carrots were rather thin so I cut the cooking time down so they didn't come out like mush out of the oven. I did substitute a bit. I used 1/2 of the cream and then used evaporated milk for the rest of the measure. The mushroom one was absolutely fantastic! When reading the recipe somehow I completely overlooked that I was supposed to have bought white and wild mushrooms!!! yikes! so thankfully I had some cremini mushrooms on hand that I could use. Used regular breadcrumbs as that is what I had on hand and I would use a bit less of them next time. kg, those gratins look great! I've been poring over the issue-- I look forward to seeing what you and ICD make! 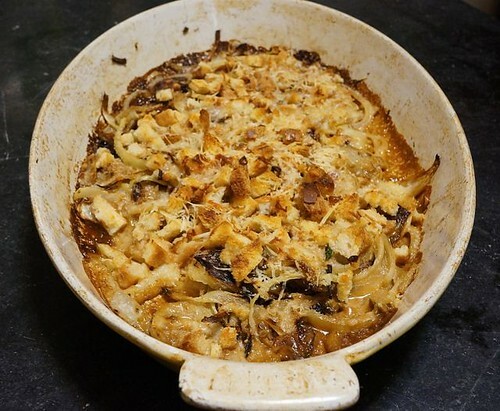 Highly recommended-- crunchy topping, creamy tender fennel with a bit of sweetness from the onion... mmm. I haven't made anything from the new issue yet, but there are a few things I've tagged. When DH works at night I tend to go for a dish of pasta so the spaghetti with freshbreadcrumbs might be dinner one of those nights and most definately the pasta with clams and broccoli raab. Just remembered that I did make 2 racks of lamb with a herb crust and DH did a perfect job of grilling them so I'll try the pesto version next time. Sorry no pictures as we had a house full of dinner guests. Oh that cake is so gorgeous! Boy! I got off to a good start this time. I am never first to post pics and reviews, I'm on a roll!! This soup was really good. I found that my soup needed a bit of salt at the end but otherwise it was a really nice soup. A great quick meal. I am eyeing that cake-- I think I need to have it for brunch-- with all that cofee, I would be up all night if I served it for dinner. An Irish coffee-themed brunch sounds like fun. I would need to make a batch of Emergency blender cupcakes for the kids. That is a great idea to make the cake for brunch. I do wish that I could count on a large crowd for such things. If I made it I would probably end up eating the whole thing by myself! I find that nowadays a lot of people say they don't want treats as they are watching their waistline, etc. Hmmm, the pozole...what to do...I grew up with a different kind, always pork, and not as thick a red sauce as what he shows. It looks like an awful lot of work (which I know to be true) but just not sure if it would yield the results I would hope for. Chasing a memory of food is never as rewarding because it never turns out to be quite what you remember. Let me know if you decide to make it. Yeah, I can see being reluctant if you have a strong taste memory of pozole-- your pork version sounds even better than chicken. I'm a total gringo, so I'll probably be happy with it! I usually don't have the problem with cooking magazines making versions of my family's traditional cooking-- sauerkraut stew anyone? Or mushroom soup with fermented oatmeal? I just can't imagine why no mags have featured Polish cooking! Anyway, I did finally get around to making something-- I happened to be near my favorite Chicago fish store and picked up some fat scallops, so I made the scallops with Brussels Sprouts from the Shellfish in 15-ish article. It was really good and super-fast-- more like 10-ish, but I won't quibble. 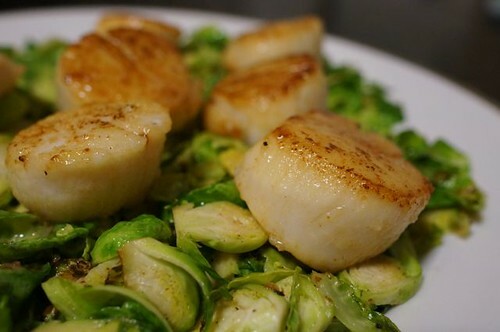 I love Brussels Sprouts and scallops-- and with a little mustard pan sauce, they make a great combination-- the sprouts stay a little bit crisp, the scallops are plump and luscious, and the mustard sauce adds a little tang. All the recipes in this article look great to me, but my crew are not big seafood fans, so we will see how many more I make-- might try the clams or mussels next-- let them eat salmon! 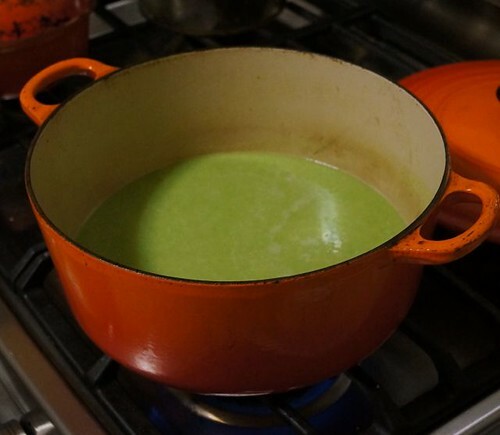 Hey kg, thanks for the recommendation-- I made the pea soup for dinner the other night and I really liked it-- the Parmesan kept it from being too sweet and added a great savory taste. To my surprise, the husband didn't like it-- he barely ate half a bowl! Boo! Ah well.... win some, lose some. I'm still looking for a suitable occaision for that cake! What's next on your list? I haven't found occassion to make the cake either and I have been so busy that I have made nice quick, simple meals for the most part. Wow, your Mother-in-law buys you cheese-- how nice is that? 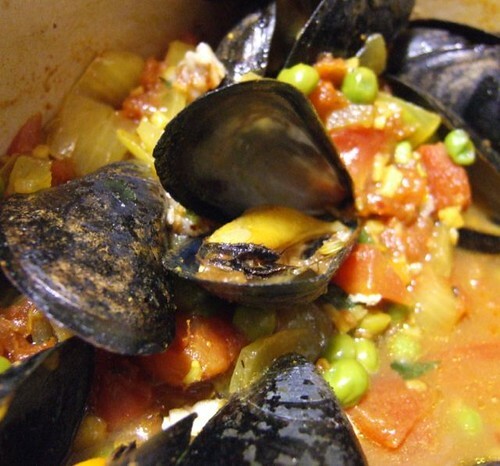 I generally like mussels, and these were good but not superb-- I think the aggressive spicing of the broth kind of detracts from the taste of the shellfish. A wine and herb broth would have been nicer. That said, I'm looking forward to the curried seafood stew. I might make the fried chicken. I agree, it's too busy to make much! I'm going to start some Xmas baking too-- I'll post that in the holiday thread, but I was eyeing the cookie article. I look forward to seeing what you post too! I'm a big fan of parm in soup and often use the rind for many soup recipes and for this recipe I've saved the braising broth from braised bacon that will add tons of flavor as well. Right now I have part of the broth set aside for a hearty pasta fagiole, but DH loves pea soup, considering the fact that I am in a waiting room (his eye surgery) I might take pity on him and give him a choice and either way the parm is in the soup. I made the mushroom ragu with polenta. Looked in 2 grocery stores and couldn't find any instant polenta. So I used the ready made stuff...it was ok. What I did is put the mascarpone on top of the polenta and then served the mushrooms on top. Overall the dish was very good. I also made the prosciutto, pasta and spinach dish...it didn't reheat very well so it was not my top choice. Maybe I can try reheating it in lower heat setting. We'll see. The Parm gift was a once in a lifetime thing :) But I am enjoying it. I'm not too sure about Brussels sprouts and scallops as I just hate to ruin a good scallop with anything but a mild companion sauce or just plain lemon or lime on occasion. While I love sprouts pairing it with such a delicate scallop I would never have thought of nor would I try the recipe with walnuts just because I don't love walnuts. I've been lazy about making anything from the magazine lately with so much going on around here, but I'm looking at the chops for tonight if I can get home at a decent hour. Good to read the reviews and I might add that I finally have all the ingredients for that lovely cake, the white chocolate was sold out of most of the stores until yesterday and I grabbed the last two boxes so we will give it a go maybe for New Year's Eve or day. I did bake a few dozen cookies nothing big deal, traditional chocolate Tatus, date bars, and a new to me recipe from John Legend (link below). The chicken was a bit of a pain to make-- much as anything that is deep-fried. Also, since you had to fry the chicken thighs in batches, it was not an especially fast recipe. The coating, which was a batter rather than crumbs, was tasty, but the real standout was the sauce. The recipe called for mayo, but I used about 2/3 yogurt in place of the mayo which lightened things up (healthy, ha) and gave it a much-needed tang. Otherwise the sauce just had garlic, Old Bay and lemon juice-- very simple. I would make the sauce again, but for all the effort and mess of deep-frying, I would make classic friend chicken (http://www.finecooking.com/recipes/class...) instead--- but I would make that sauce again in a second! I have never seen Old Bay seasoning up here. I will have to look next time my inlaws go into Buffalo. I still want to back track to that classic fried chicken recipe. The Old Bay is really good. I used a knock-off version sold by The Spice House-- it was called Cheseapeake Bay seasoning (http://www.thespicehouse.com/spices/ches...). I think Old Bay is a Southern thing, so you might not be able to find it in Buffalo. Actually, there is a Penzey's in Buffalo, and they are related to The Spice House-- same family-- so you can get their version: http://www.penzeys.com/cgi-bin/penzeys/p.... Do you shop Penzey's? Dangerous!! Definitely try the fried chicken-- mmm. The funny thing about the chicken recipe is that I cooked it for my husband's favorite aunt-- the one who provides free babysitting. She has "gouty arthritis", so she can't have a lot of beef or pork. But that morning I had been cooking beef stew, so the house smelled amazing. She even commented on how good the house smelled-- I didn't have heart to tell her it was tomorrow's dinner and something she couldn't have... but she seemed very happy with the chicken. Speaking of backtracking, I also showed her the Irish whiskey cake from the front cover-- now, that is something she could eat-- I might have to make it for her birthday, as she is babysitting again this Saturday, haha. Having grown up near Phillips' crab house on the eastern shore, I much prefer their seasoning to OB. Fortunately over the years since the 60's I've had easy access to it in bulk, but I had to order 25 pounds in bulk the last time. I had several friends that needed a few pounds and the rest is packaged and stored in the freezer. I'm not a fan of OB and I would rather search out a fresh version from a spice house or even consider making my own with the freshest spices available. I love chicken wings and Smokestack's recipe is fantastic even if it calls for OB so that is on the menu tonight along with my most recent fabulous fish chowder with a pinch of seafood seasoning. Yes I do use a good amount of seafood seasoning a seasoning staple near the ocean for sure. I've been substituting plain yogurt in a lot of recipes thanks for the hint on the sauce for the chicken and if I end up with company for dinner I might make it for my wings. Celery Salt (Salt, Celery Seed), Spices (Including Pepper, Mustard, Allspice [Pimento], Cloves, Bay [Laurel] Leaves, Mace, Cardamon, Ginger, Cinnamon [Cassia]), and Paprika. ICD, holy cats, how much volume is 25 pounds of seafood seasoning!!! Did it come in a 5-gallon pail? You should give it as wedding/holiday gifts. Also, you're right, I can't actually speak to the taste of Old Bay itself, because I did go to a spice shop for their own version. I'm not sure I've seen Old Bay in the markets around here. kg, I vote for the Buffalo Penzey's! They used to package in 1 lb packs and the last ime that I ordered, it was 2 lb packages and yes anyone that I know that cares about seafood gets some on occasion. Too funny, but it is just fine in the deep freezer. BTW just a tad in my chowder tonight, fabulous! Usually when we go into Buffalo or my inlaws go the only good place we hit is Tops so no spealty stores for me. They are not foodies like me so it may be a bit scary to send them to a store like that as they will think I spend money like that on groceries all the time!!! :O HA! I have a friend who lives in San Francisco so maybe he can find it for me. Now that would be a nice surprise for the aunt!!! Do post pictures if you make it, yum!